US tech giant, Google has introduced Artificial Intelligence (AI) Research laboratory in Ghana to help solve a wide range of issues. The Accra centre, which is the first its kind in Africa will make discoveries using AI to help address economic, political and environmental issues. 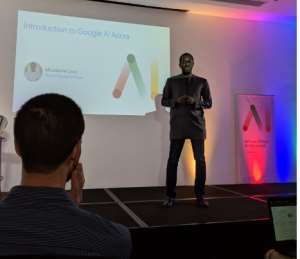 With similar centres in New York, Paris, Tokyo and Zurich, the Head of Google Accra AI Laboratory, Moustapha Cisse, who introduced the research team said the group will critically diagnose the issues in the agricultural, health and educational sectors. This, he noted, will enable the centre apply research to Google products which will help develop applications that are responsive and can address problems. Mr. Cisse added that the centre will collaborate with researchers already established in Ghana and across Africa to create the need impact in the country. Today, we introduced the Google AI Accra research centre. The centre is made up of a group of researchers and engineers working to advance artificial intelligence and also solve important problems relevant to the context of our research and focused areas. Our team itself is very international made up of 10 people from different countries. We will collaborate with institutions across the African continent and work with local engineers and researchers in the field of AI. Our goal is to advance the frontiers of science. We expect to have a scientific impact on our research areas by applying technology to agricultural, health and other relevant sectors of the economy. Beyond the purely technical and foundation of experts of machine learning and AI, we have spoken about few areas that are of interest to us. We have spoken about agricultural— how can we use AI to diagnose certain crop diseases, healthcare, education and analyse satellite images inorder to inform policies in humanitarian perspective. What about those without smartphones? We will build artificial intelligence in a way that can be deployed in resource-constrained environment considering the type of phone that is widely used in Africa and not just the big devices and computers that these technologies can be deployed. One of our goals is to ensure technology is built in a way that it is easily understandable and usable by non-experts.